The Songkran festival is celebrated in Thailand as the traditional New Year’s Day from 13 to 15th April. The Songkran Festival is also known as Thailand Water Festival, celebrated in the beginning as a way for the Thai people to splash water on their family members and elders as a means of good luck and pay their tribute to images of Buddha. 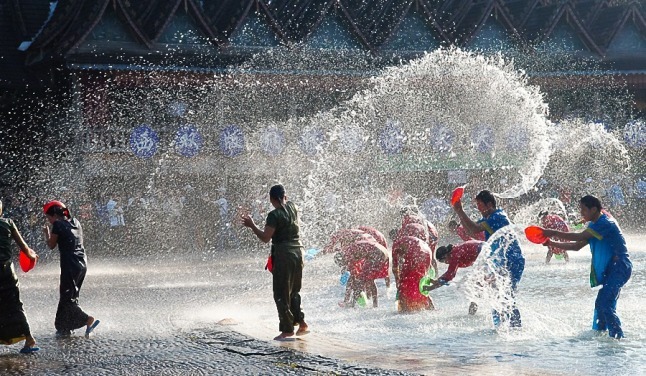 Today, the festival has transformed into three days of water play, sprinkling locals and visitors alike with buckets of water, water hoses and super soakers as they gather in the streets. In 2014 “Celebrate Singapore”, a large two-day Songkran-style water festival, was planned for Singapore and the event was promoted as the “largest water festival party in Singapore”. 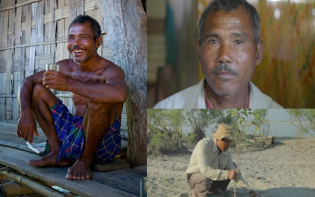 The festival is also celebrated by Singpho, Khamyang, Tikhaks (Tangsa) and Phakyal community of Arunachal Pradesh, and Tai Phake community of Assam. Sangken generally falls in the month of ‘Naun Ha’, the fifth month of the year of the Khampti Lunar calendar coinciding with the month of April. It is celebrated in the last days of the past year and the Lunar New Year begins on the day just after the end of the festival. Chiang Mai holds the biggest, most popular Thailand Water Festival parade, which includes statues from local temples being moved out and paraded throughout the streets in honour of this very special time of the year. Everyone is invited to take part in the parade by carefully and respectfully, pouring water over the legs and arms of the Buddha. One reason that Chiang Mai most likely commemorates Songkran more vigorously than other locations in Thailand is, that a large number of people from Chiang Mai work in Bangkok and neighbouring cities, therefore it gives them a chance to return home and commemorate the days with their family and friends. The hottest month of the year in Thailand, April may be fit for water matches and street parties that last nearly a week. The traditional water pouring is meant as a symbol of washing all of the impurity away and is sometimes filled with fragrant herbs when celebrated in the traditional manner. The second day of Songkran is officially the National Family Day. Families wake up early and give alms to the monks, then ideally the rest of the day would be spent sharing quality family time together. Before Thailand adopted the international New Year’s Day in 1940, Songkran was calculated based on the solar calendar, which varied from one year to the next. An important religious ritual on Songkran is ‘Bathing the Buddha image’, in which devout Buddhists pour fragrant water over Buddha statues both at the temple and at home. More religious Thais engage themselves in Buddhist ceremonies and merit-making activities throughout the holidays. A Miss Songkran Beauty contest is held in the Wisutkasat area, accompanied by merit-making, a parade and other fun activities. Food is featured with many seasonal treats available in hotels, restaurants, and from food vendors on every street or soi. Special Songkran menus at some hotels and restaurants are quite popular during this time. A more traditional Songkran is available in the Phra Pradaeng district where the Thai-Raman communities live out their Songkran traditions. Here, the celebrations take place about a week later than in central Bangkok and is filled with cultural significance. An array of cultural activities, such as the Thai-Ramn flag ceremony, ‘saba’ game, Raman dances, boat races, floral floats parade, and many more may be experienced here. 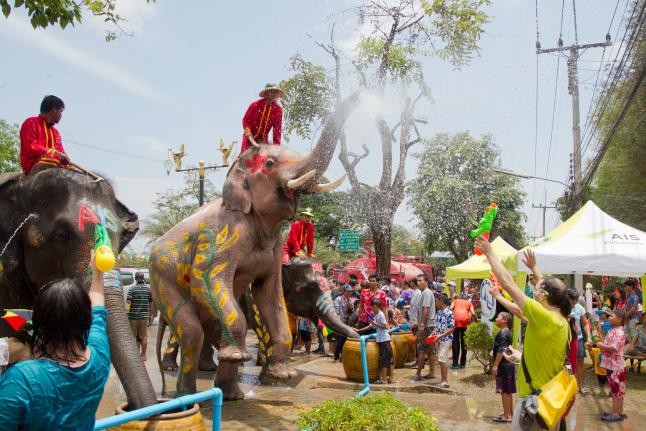 There are several major Songkran celebrations hosted around Thailand such as Bangkok, Pattaya, Phuket, Chiang Mai, Hua Hin, and Khon Kaen that may give its visitors plenty of opportunities to experience getting wet which is also said to bring good fortune throughout the upcoming next year. 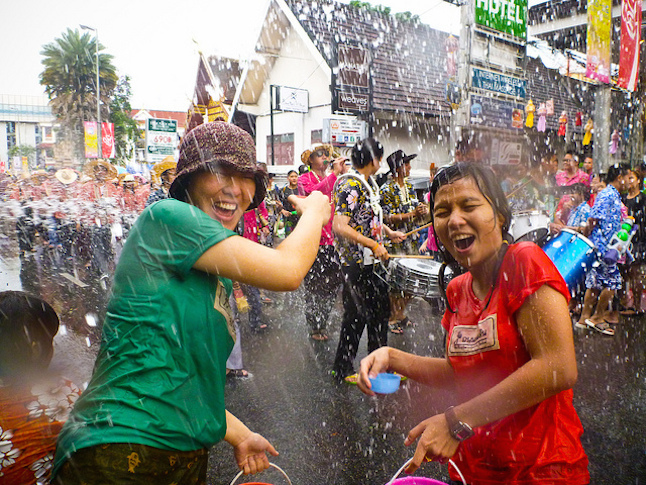 What are some traditional ways Thai families celebrate Songkran?